I am in shock. 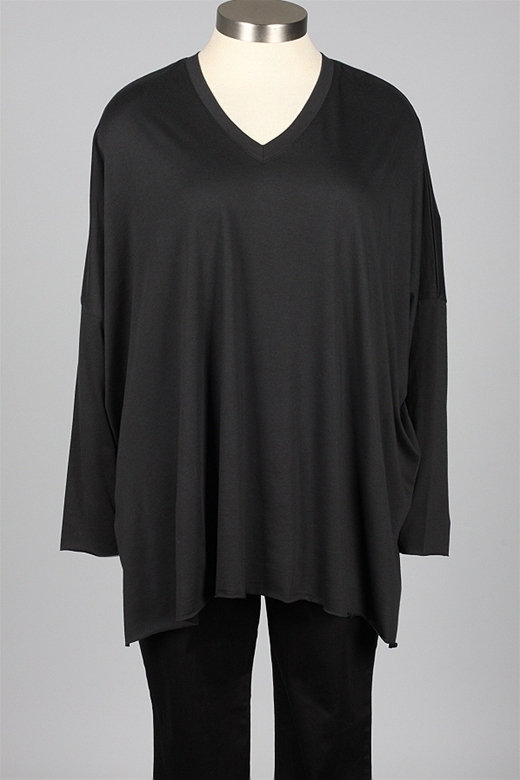 Desperate for plus size, reasonable quality, plain black, summer t-shirts in 100% cotton, I purchased the EZ V T by Planet, seen above, from the States. It has cost me c.£160! I hesitate to name the store I bought it from as they charge what might be seen as a perfectly justifiable $132 for the tee. 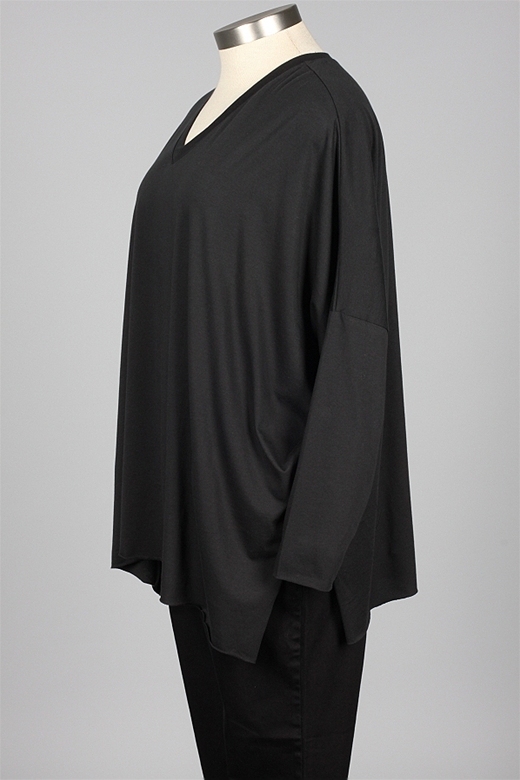 With the scarcity of plus size, 100% cotton, black tees in the right length with a neckline that works for me, I was OK with $132 (c.£85) as a start price … thought it would maybe be £120 with shipping and import costs. I ordered only one though as, so often, when you get things, they aren’t the quality, size, fit you like and I can never be bothered to send stuff back … my sister and mother do rather nicely out of my rejects. In fairness, the shipping store did check the delivery charge – $60 – with me pre-despatch. I OK’d it, after gulping, as, if I liked it, I would order more quantity per order next time. Of course that meant I was almost at my £120 early guesstimate with import duties to add on. They were £39! I got the tee this morning. It’s … fine. For pity’s sake! Fine. I am paying £160 for a – yes-that-is-damning-with-faint-praise – fine T-shirt. I feel like weeping with annoyance and frustration. Why, why, why is it so hard to get what I want? Plus size. Plain black. 100% cotton. 30-32 inches (75-80cm) long. Three quarter or long sleeves. Low but not bra-exposing neckline. Preferably A-line shape. NO buttons, bobbles, glitter, frills, pockets, slits, slashes, sequins, synthetics at all. Good quality in design, make and fabric. Not more than, around, £100 ($150). I probably won’t be back for more of the Planet tops because, at that price, I have already had a couple made to order to my own design which I like a lot more. How ridiculous is that I am able to do that? For plain tees, bespoke design and order probably sounds like a luxury but I just find it a drag. It has to be organised, waited for … yawn, yawn, yawn. It really doesn’t make me feel special at all … more like a freak! I wanna buy this basic stuff off the peg like everyone else but I cannot be flexible on my criteria because of my illness, the wheelchair and the carers. Grim style reality is constantly trumping my style aspirations. Anyone got any helpful suggestions for reversing that dynamic?